When originally published in 1947 "Ratty" (as the Ravenglass & Eskdale Railway has always been known) was still very much a working railway, carrying significant quantities of Beckfoot granite as well as large numbers of holidaymakers in the summer season. 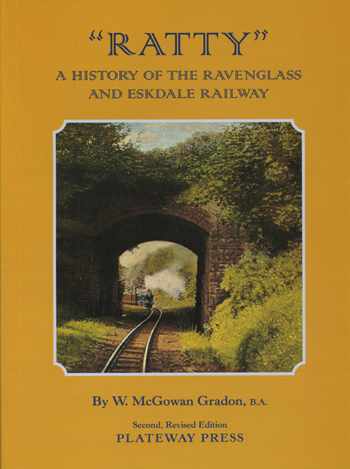 McGowan Gradon's book was the first complete history of the railway, tracing its origins from the original 3ft gauge railway opened in 1875 for mineral and passenger traffic, through the period of dereliction and rebuilding to 15 inch gauge in 1915 and its varied fortunes over the next 30-odd years. Included are full details of the locomotives and stock and a complete description of the line. This new edition retains all the original text with only minor factual corrections, but with an entirley new collection of illustrations, covering the entire period of the railway's life before the rescue for preservation in 1960. Softback, full colour cover, 46 black & white photographs.